In this astonishing story, journalist Dan Slater recounts the unforgettable odyssey of Gabriel Cardona. At first glance, Gabriel is the poster-boy American teenager: athletic, bright, handsome, and charismatic. But the ghettos of Laredo, Texas—his border town—are full of smugglers and gangsters and patrolled by one of the largest law-enforcement complexes in the world. It isn’t long before Gabriel abandons his promising future for the allure of juvenile crime, which leads him across the river to Mexico’s most dangerous drug cartel: Los Zetas. Friends from his childhood join him and eventually they catch the eye of the cartel’s leadership. As the cartel wars spill over the border, Gabriel and his crew are sent to the States to work. But in Texas, the teen hit men encounter a Mexican-born homicide detective determined to keep cartel violence out of his adopted country. Detective Robert Garcia’s pursuit of the boys puts him face-to-face with the urgent consequences and new security threats of a drug war he sees as unwinnable. 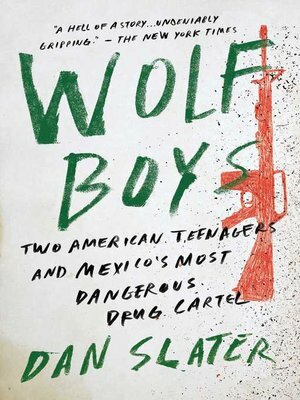 In Wolf Boys, Slater takes readers on a harrowing, often brutal journey into the heart of the Mexican drug trade. Ultimately though, Wolf Boys is the intimate story of the lobos: teens turned into pawns for the cartels. A nonfiction thriller, it reads with the emotional clarity of a great novel, yet offers its revelations through extraordinary reporting.